The first of Ponant's Explorer-class of six expedition ships, Le Laperouse combines sleek and attractive Scandinavian design with French flair and luxurious extras that are unusual in the adventure cruising space. The 184-passenger ship debuted in 2018, with destination-intensive itineraries that take it to Iceland and Scandinavia, the Mediterranean, the Seychelles, and the Maldives. It's built for active exploration; the vessel has a reinforced hull for polar exploration as well as a fleet of Zodiacs and an aft marina for water sports. But if you simply want to laze, Le Laperouse has spaces for that too: There's an infinity pool that's great for warm weather destinations and a terrific sauna when you're cold (not to mention a spa and an onboard store full of French goodies). 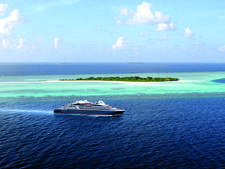 If you're sailing on Le Laperouse, you may not have booked with Ponant directly; the company has a partnership for full and partial small ship cruise charters with Tauck, as well as Abercrombie & Kent and Gohagan, which runs university alumni trips. The group you booked with might influence your experience, as well as your inclusions. Tauck, for example, has its own cruise directors onboard and gives a choice of included excursions, while only those that use Zodiacs are complimentary to Ponant passengers. 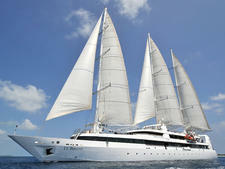 If you're on a charter, it's best to check with your tour operator to see exactly what's included. No matter how you book, design lovers will appreciate the airiness and attention paid to details throughout the ship. In the cabins, white leather fronts the closets, the bathrooms are attractively modern with glass-enclosed showers and every stateroom has a balcony. Suites have Hermes products, butler service and expansive verandas, including one that boasts its own hot tub. One of the most anticipated features of Ponant's Explorer-class ships is the Blue Eye Lounge, an underwater bar/enrichment space aimed at exposing passengers to marine life. The tone is set as soon as you walk off the elevator; you're engulfed in deep blue light and the space itself has curvy decor meant to evoke a whale skeleton. The windows, shaped like whale eyes, let you see what's going by, while hydrophones, integrated below the ship's keel, capture ocean noises up to 3 miles away; the sounds also vibrate on the room's sofas. Images of sea creatures are projected onto digital screens. On a typical cruise, the Blue Eye Lounge is used twice for marine shows, one during the day and one in the evening. The space only seats 30 people, so passengers are divided into groups and provided designated show times. When shows aren't going on, the Blue Eye Lounge is open as a bar in the evenings. We predict it will be most popular in warm water destinations with good visibility; on our trip, for the ship's christening in stormy Iceland, you couldn't see much. One final note on Ponant: While the company has become global with all cruises being bilingual, the atmosphere is unapologetically French. Expect French food rather than regional specialties or American favorites, with menus designed in partnership with Ducasse Conseil, a company headed by famed Michelin-starred chef Alain Ducasse. Choices may be fewer than you find on a typical American-helmed ship, and your fellow passengers, unless you're on a full charter, will likely be an international mix. If you're the type of person who likes things exactly as you have them at home, Ponant may not be your best option. But the line does offer outstanding expedition itineraries and with Le Laperouse now in service, ships that will make you comfortable indeed. The makeup of passengers on Le Laperouse will depend entirely on whether the ship has full or partial charters onboard (between 25 to 30 percent of all of Ponant's cruise passengers come from charter bookings). 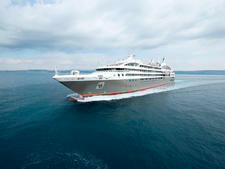 The luxury tour company Tauck uses Ponant for both full and partial charters, and those sailings are primarily comprised of Americans, with a handful from Canada, England and Australia. Smaller charter groups, such as a university alumni sailing or a luxury Abercrombie & Kent tour, are also likely to be made up of Americans. 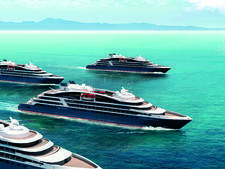 The rest of the passengers will be from France, where Ponant is a well-known brand, other European countries or Asia. French and English are both used onboard. The company notes that it doesn't have an official dress code, although keep in mind that the French do tend to dress up more at dinner than Americans do; you'll likely see them in jackets and nicer dresses on the ship's Gala Evenings. Daily wear is casual and geared toward the destination and expedition activities; dress practically for the weather. If you are cruising in the Arctic or Antarctica, you'll receive a polar parka to wear in your size. Jeans, T-shirts and flip-flops are not permitted in the main dining room. Gratuities are included in your Le Laperouse fare. Drinks are included in the fare unless you buy premium wines or alcohol, so no need to tip. Spa tipping is at your discretion. The onboard currency is the euro. The French flair shows in Le Laperouse cabins, which are light, airy and contemporary, while still having luxurious touches. Textures are important to the line; the walls are slatted blond wood with starburst pieces of artwork and the blankets, linens and pillows look extremely snuggle-worthy. The color palette is primarily shades of blue, white and cream. All Le Laperouse accommodations have balconies, air conditioning, two twins that can be pushed together to form a king-sized bed, shower, mini-bar, flat-screen with satellite TV and video on demand, a desk with stationery, iPod players, safe, hair dryer, bathrobes and French bath products. Each cabin is outfitted with 110/220-volt outlets and internet access. Room service is available 24 hours per day. 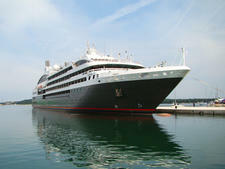 Standard staterooms: The Deluxe and Prestige cabins are 205 square feet, including a 43-square-foot balcony. There is one accessible Prestige cabin. Suites. Suites are more spacious, ranging from 291 to 484 square feet. The Deluxe Suites are 290 square feet, including a 65-square-foot balcony, and have a sofa that can accommodate a third passenger. Prestige and Privilege Suites are 344 square feet and also can hold three people. Suites have walk-in closets. The four top suites are at the aft of the ship and have expansive balconies of 323 square feet. The staterooms themselves are 484 square feet and are true suites with separate living and sleeping areas. They also have bathtubs and showers. Three of these are called Grand Deluxe Suites; the fourth, the Owner's Suite, has a Jacuzzi on the balcony. All of these suites feature butler service. Ponant is a French line, and so it's probably not a surprise that it looks to a French icon for dining inspiration. The company partners with Ducasse Conseil, a company run by Michelin-starred chef Alain Ducasse, for meals. 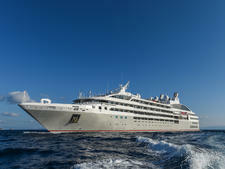 Ponant includes drinks in its fare, although you're restricted to house wines, which are limited. A menu of premium wines and drinks can be bought a la carte, and the line also offers a Premium drink pass for 20 euros per day, per person; the pass allows you to have premium liquor in your mixed drinks and also gives you a better wine selection. While the line does have a partnership with Veuve Clicquot, the house Champagne is Henri Abele (the good stuff is served at gala receptions at least once per cruise). Restaurant (Deck 4): Light and airy as the rest of the ship, the main Restaurant is designed to accommodate all passengers at once for all meals. Buffets will feature salads, cheese and sweets, with a la carte entrees served by waiters. There is also an outside area where passengers can dine. During our quick tour of the ship, we had a four-course meal in the Restaurant, which features Alain Ducasse specialties. The menu was heavy on seafood, with delicate flavors and gourmet presentation. Carb-lovers will not want to miss the French butter for their bread. A vegetarian menu was also available, signifying the line's focus on improving options for non-meat eaters. If you have dietary restrictions, it's always best to let the cruise line know before you go, and meet with the dining room manager when you board. Grill (Deck 3): Although it was not in operation during our tour, Le Laperouse has a grill outside the Panoramic Lounge near its infinity pool. We're told the all-day dining menu focuses on grilled meats, salads and desserts. Room Service: Room service is available free of charge for all cabins, 24 hours. Le Laperouse has a theater that seats 188 people. It's equipped with an LED wall as the backdrop, allowing for multimedia presentations and lectures. 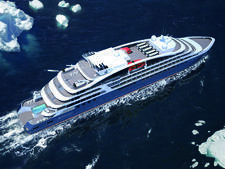 Blue Eye Lounge (Deck 1): An innovative concept for expedition cruising, the Blue Eye Lounge is aimed at bringing marine life to passengers in a relaxed setting. The lounge is indeed dark blue, and accessed only by a 10-person elevator and a staircase; getting there could be a perilous proposition for those with mobility issues. Once you're there, it's otherworldly. Digital images of sea life dance across the walls; when the ship is sailing, cameras on the outside of the ship will project underwater photos in real time. Hydrophones pickup sounds of whales, dolphins and other sea creatures, and the furniture vibrates in unison. The decor is curvy with white accents that mimic the inside of a whale; the windows looking out are shaped like whale eyes. It's all very Jacques Cousteau, who was named by lounge architect Jacques Rougerie as an inspiration, along with Jules Verne. As noted earlier, passengers attend shows in the Blue Eye Lounge twice per cruise, in pre-arranged groups of 30. When the shows are going on, the lounge will be a "quiet space," with no talking and drinks will not be served. When shows aren't in session, passengers can go down to Blue Eye Lounge in the evenings, when it operates as a regular bar. Main Lounge (Deck 3): All passengers can sit in the main lounge, which continues the ship's blue and cream color scheme. A bar anchors the space, which also has a grand piano and a dance floor. The lounge space flows naturally into the Grill, which is just outside. Panoramic Lounge (Deck 6): At the fore of the ship, the Panoramic Lounge is a more intimate venue, with a small library and bar. There's outdoor seating here too -- and the view is, as the name would suggest, gorgeous. Le Laperouse has a small infinity pool that boasts a counter current for exercise. It's a bit public for a pool, as it's located near the Grill, plus swimmers are fully visible to anyone on lounge chairs near the marina one deck below. The water sports platform extends when the ship is anchored and is accessible from Deck 2. Passengers can use the space for kayaking, paddle-boarding and getting into Zodiacs for expeditions. What's cool about the entire marina area is that there are sun loungers available -- so even if you don't want to be active, you can watch those who are (plus see the people swimming above you). Located on Deck 3, the ship's entrance area is where you'll find the front desk, excursion services and a small shop that sells French goods, postcards and Ponant logowear. Deck 3 also has a medical center staffed by a doctor and a nurse. 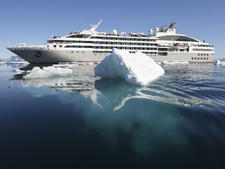 The line says that medical information is requested from passengers for cruises to Antarctica, the Northwest Passage and transoceanic voyages. (This is due to the fact that ships are often far away from land on trips like this.) Consultations and medications require a fee. A significant chunk of ship real estate on Deck 5 is dedicated to the photo studio. The line has a photographer and a videographer onboard, and passengers can purchase wildlife and scenery photos from the cruise, if they don't want to invest in their own camera. Wi-Fi is complimentary and available throughout the ship, but might be slow or nonexistent in some remote areas. Le Laperouse has a spa on its highest deck, Deck 7. The treatment rooms are light-filled with windows looking out to the ocean. Massages, body treatments and facials are all available; a 45-minute massage costs 100 euro. There's a salon here as well, offering hair styling, barbering, manicures and pedicures. The spa area includes a lovely sauna that's larger and prettier than you'd expect on a ship this size. With a window facing the outdoors and long curvy benches, it's an enticing retreat after an active expedition. Le Laperouse has a fitness room on Deck 7, just across from the salon and spa area. It's fairly small, but does have lovely windows and sea views. Cardio equipment includes two treadmills and a bike; we didn't see any free weights during our tour. Le Laperouse contracts with the active tour company Backroads for some charter cruises. On those trips, Backroads is responsible for making bikes available in port. Le Laperouse accepts children 8 years and older; kids younger than that may sail depending on the itinerary. The ship has no formal programming for kids, although when several children are onboard, there is a hangout room with a TV set aside for them.